The muffin recipe you are about to sight today is very buttery, so moist and is super heavy on the texture. Heavy on tart-sweet cranberries, a handful of pistachios and two handfuls of white chocolate. Oh and a hint of orange notes in the background! So yum! Yeah. I did not stop right there! Instead I glazed my muffin with some a river of melted chocolate glaze to balance the tart in cranberries. Okay. I get it! It’s way more unbalanced with all that sweet chocolate now. But I recommend you do to. Thank me later! Pistachios and orange zest perfectly complement the sweet white chocolate in these cranberry and orange muffins. Flavor blast in each bite! There are so many stars in our healthy-ish muffin recipe today! Second, A river of white chocolate or dot your muffins with white chocolate chips. I leave it upto you. Don’t forget to throw in a handful of super green pistachios. Protein packed and taste wonderful with a slight crunch. Oh and all that orange zest and juice? Don’t skip or add less zest than the recipe states. It makes all the difference. And the soldier behind our wholesome cranberry orange muffin recipe today? Whole wheat flour. Yields the most hearty, yet soft and light muffin. Without even a trace of nutrient-deficient and processed all purpose flour! Now wouldn’t you adore a pretty looking muffin such as this one? To me these look like a little christmas party that I can enjoy all year long! I mean look at all that red, green and white. 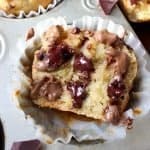 These muffin are so light, tender, fluffy, buttery and moist to taste. Look at all those small air pockets throughout the bake! A divine texture texture party is going on in these festive muffins (Hellooo! cranberries, pistachios, sweet orange and white chocolate). The flavor combination is so beyond ordinary in today’s whole wheat muffin recipe. Plus these are so easy and satisfying! Also they make for such a pretty looking, dessert like morning breakfast! Let us kiss winter a goodbye with our cranberry orange muffins today! But we are sure to bake these whole wheat and flavor rich muffins all year around! Love this whole wheat muffin recipe? The you are sure to like my banana muffins without apf. or these super high rising coffee muffins with walnut and chocolate. Want another sweet orange muffin recipe? I got you covered. 1. Preheat your oven to 425°F and spray a 12 count muffin pan with nonstick spray. Or you can line the pan with cupcake liners. Set it aside. 2. Sift baking powder, baking soda, salt and flour together at-least three times and set it aside too. 3. In a mixing bowl using a handheld or stand mixer, beat the butter, granulated sugar and brown sugar until light and creamy. About 3 minutes. Now add in the eggs, yogurt, vanilla extract, cardamom, milk, orange zest and juice. Incorporate it all well. 4. Mix the dry ingredients into wet and fold in just until combined. A few visible small lumps are okay! Add in cranberries, white chocolate chips and pistachios. Fold lightly. Save some to decorate on top. 5. Pour batter in the pre-lined pan and sprinkle with remaining nuts, berries and chocolate chips. Bake at 425°F for 5 minutes. Then lower the temperature to 350°F and continue to bake for 13-15 minutes or until a tooth pick inserted in the center of a muffin comes out clean. 6. Take the muffins out when done and allow to cool further on a wire rack. 7. Melt white chocolate (if glazing) in the microwave in 15 seconds increments and spread over cooled muffins. Top with more texture (pistachios and cranberries) if needed. You can either mix your white chocolate chips in the batter and bake. Or you can glaze your muffins with melted chocolate skipping the chocolate chips from recipe. Tastes yum, either way! Adding cardamom is optional. You may skip it if don't like it in your muffins. To make these muffins vegan and dairy free, use egg replacer instead of eggs; replace milk with coconut milk; Substitute plain yogurt with vegan one (I use So delicious coconut milk yogurt alternative) and earth balance butter. The muffins rise very well with these substitutes and are very moist to taste. 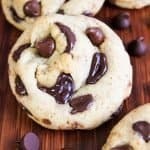 You could also use a gluten free flour for this recipe. These are wonderful! And so pretty!!! White chocolate + cranberries is such a good flavor combo! These look sooooo good, and I love that there are pistachios in there for a little crunch! I too love all the flavor and crunch that pistachios pack in these muffins. Thanks for stopping by! Neha – these are gorgeous – and I’m in such a white chocolate mood right now! The addition of orange, cranberry and pistachio sounds like something I need to make ASAP – they are lovely, too! While reading your post, I was thinking about exactly the same thing: Christmas but every other day 🙂 Thank you ! Cranberries are one of my most favourite berries Neha! I have them on my breakfast in the morning and I love using them in quite a lot of my recipes too. So, I love these cranberry orange muffins. The addition of the pistachios and melted white chocolate glaze is just heavenly! You sure can use cake flour Megha! And dried cranberries would just be fine here, I have used the same! We love this delightful cranberry orange muffin recipe for sharing around the holidays. They are so easy to make ahead and freeze till you are ready for guests. Get Recipe Here.